DSP and functionality plugins are listed here. If you'd like to add a plugin, select it from the dropdown box and click Add. The About button opens the about dialog of the plugin, which usually contains version information. Once a plugin is added, it'll be shown in the list. The Reverb and Equalizer DSPs are built-in, so they are always present. To open a plugin's configuration, select it in the list and click the Config button below the list. The Up and Down buttons allow you to change the order of the DSPs, the Remove button removes the selected plugin from the DSP chain. In some cases (for example xmp-scrobbler), you'd like a plugin to persist for all tracks, even if those have separate Saved Settings. In that case, you can tick Exclude from saved settings, to make sure the plugin is always loaded. Note that this option is only available for plugins which allow only a single instance. 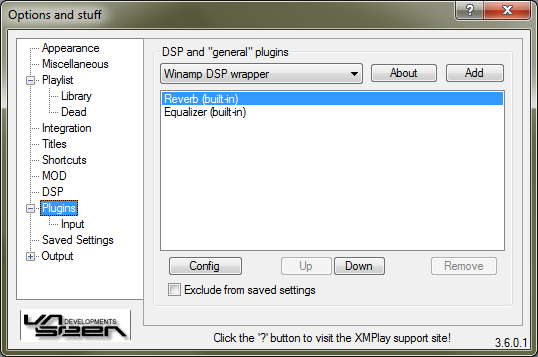 XMPlay can use most of the DSP plugins built for Winamp via a wrapper. Add the wrapper to the DSP list and click Config to open the wrapper config. 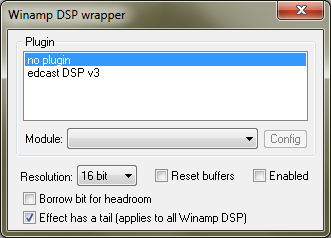 One instance of the wrapper can load a single Winamp DSP plugin, but you can put multiple wrappers in the DSP chain. From the Plugin list, select the plugin you'd like to use. The Config button opens the plugins configuration window. Note that you have to tick the Enabled checkbox for the wrapper to actually feed audio to the plugin. The rest of the options apply to the wrapper. The Resolution dropdown box determines the resolution of the audio XMPlay passes to the plugin. 24 and 32 bit is supported, but most Winamp DSP plugins only support 16 bit. The Reset buffer checkbox resets the audio buffer of the plugin when seeking or changing tracks, to remove any sound from the previous tracks. If a plugin increases the volume of the sound, the audio may sometimes start to clip. To avoid this, the wrapper can Borrow a bit for headroom. If a DSP introduces some kind of echo or reverb, there will be sound just after the original file goes silent. To notify XMPlay of this, tick Effect has tail, so XMPlay doesn't cut off the track. A detailed guide on how to set up an IceCast stream with XMPlay can be found in Advanced output: Icecast streaming.